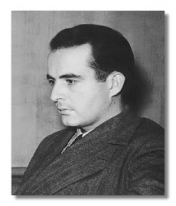 Samuel Osborne Barber was born in West Chester, Pennsylvania on March 9th 1910 into a musical family. His Aunt was Louise Homer – a leading mezzo-soprano at the Metropolitan Opera, who was married to Sidney Homer, a widely respected composer and a wise mentor who had a strong influence on Barber. At an early age Barber began to show his musical capability and potential. He wrote his first musical piece at the age of 7 and attempted his first opera at the age of 10. At the age of 14 Barber entered Philadelphia’s Curtis Institute, where he studied voice, piano and composition. It was here that Barber met fellow student Gian Carlo Menotti: this was to be the start of a lifelong personal and professional relationship. Menotti wrote the libretto for Barber’s opera “Vanessa” – America’s first “grand opera” in the European style – for which he was awarded the prestigious Pulitzer Prize. Barber’s music has been championed by a huge number of renowned artists, musicians and conductors. 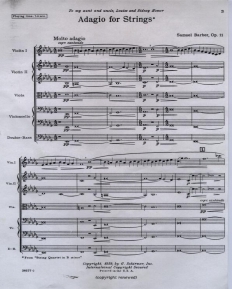 Barber's intensely lyrical Adagio for Strings has become one of the most recognizable and beloved compositions in classical music – it is heard regularly on the concert stage and even in films, notably providing the closing scenes in both The Elephant Man and Platoon. Barber was of Scots-Irish ancestry and was passionate about Ireland – a passion derived from a deep love of Irish literature and poetry, especially Joyce, Yeats and Stephens, whose works provided the texts for many of Barber’s finest songs. 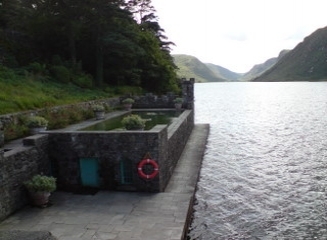 During the summer months from the 1930s to the early 1980s Glenveagh became an open house for the celebrities of the day: the guest list included Greta Garbo, Clark Gable and Marilyn Monroe. 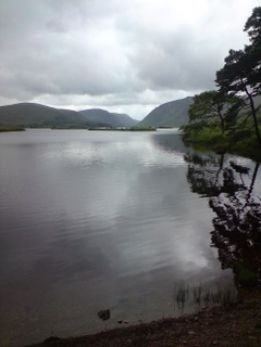 “We left [Glenveagh] after a week of candlelight . . . and peat and Gaelic twilight. I sank rather easily into the latter and began to read a lot of Yeats again; A.E. 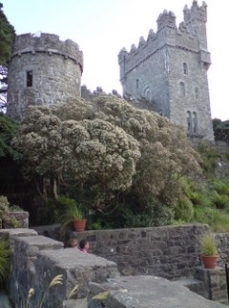 himself had stayed in the castle and there are many people around who have seen wee folk, leprechauns and other such. "Driving down to Dublin we stopped at Yeats' grave. I had been immensely moved rereading him and wanted to see if they had really marked his grave with the bitter words of Ben Bulben in a country church-yard where his grandfather, I think, was parson. I do not remember this poem line by line and do not have it before me, but I think his family and friends took him too literally when they used this poem on his tombstone. There the words are, on a very plain tombstone in this little country church-yard, far off from nowhere; there was not a sound, only swallows darting; it could have been any country church in Chester County, Birmingham, for instance. It was dusk and there was one farmer pausing in the field, leaning over a fence and smoking while he stared over the graves towards Ben Bulben and over the fields where Yeats had so often walked as a child. Silence. On the stone W. B. Yeats, the dates, and these words: "Cast a cold eye On life, on death: Horseman, ride on."